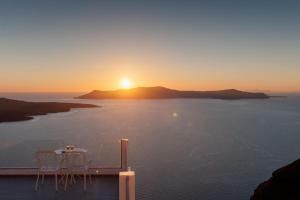 Hotel Villa Renos, located in Santorini's caldera, is an establishment decorated in the Cycladic style, offering accommodation with a large balcony with panoramic views of the Aegean Sea and the volcano. 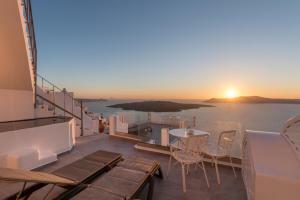 Room with a spacious balcony with panoramic views of the Aegean Sea and the volcano. Includes free Wi-Fi and a flat-screen TV with satellite channels. 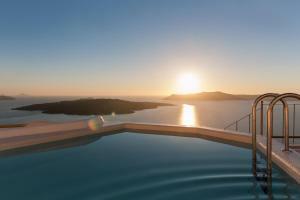 Room with a spacious balcony with panoramic views of the Aegean Sea and the volcano. Includes free Wi-Fi and a flat-screen TV with satellite channels. It also has an outdoor hot tub. This suite has a balcony with views of the caldera, air conditioning and a minibar. This suite has a balcony with a view of the caldera, air conditioning and an electric kettle. This twin / double room has a balcony, soundproofing and air conditioning.